Jordi Munoz had no training. Scant schooling. Little money. He also had a video-game console and nothing else to do. So he built his own drone. A Mexican native, Mr. Munoz married an American citizen and moved to Riverside, Calif., in 2007. While waiting for his green card, the 21-year-old was marooned in his apartment, unable to work, attend school or obtain a driver’s license. On the other hand, he had an Internet connection. A Nintendo Wii. A radio-controlled toy helicopter his mother had given him to help kill time. Tinkering with the Wii’s control wand and a $60 gyroscope he had purchased on eBay, he modified the helicopter to fly itself, just like the $5 million Predator unmanned aerial vehicles deployed by the U.S. military. Five years later, Mr. Munoz is co-founder and CEO of 3D Robotics, a San Diego-based company that has 18 employees and earned more than $300,000 in revenue in December producing components for hobbyist drones. “The first time I was able to successfully fly with my autopilot was one of the happiest days of my life,” said Mr. Munoz, now 25. “The whole thing cost less than $200. Believe me, that was a lot of money for me at the time. Mr. Munoz’s vision is hardly unique. Once the stuff of science fiction, autonomous aircraft are on the verge of widespread commercial and personal use, with pending federal regulations set to integrate drones into American airspace by 2015. Soon, experts predict, drones will be used to transport air cargo. Assist with search-and-rescue. Perform police surveillance. Inspect oil pipelines and sprawling vineyards. Follow and photograph tabloid targets such as Lindsay Lohan. Increasingly capable and affordable, as large as jetliners and as small as oversized Frisbees, drones also raise serious questions about privacy and safety. Ms. Cummings saw it coming. As a Navy pilot, she experienced the technological jump from old-school, hand-flown A-4s — the jets used as the pretend enemies in the film “Top Gun” — to newer, more computerized F-18 fighters. A second jump occurred in the mid-1990s, when self-guided Tomahawk cruise missiles entered widespread deployment and Navy fighters began making automated landings on aircraft carriers. Today, drones largely are confined to the military, which reportedly has more than 7,500 vehicles in service, and hobbyists such as Mr. Munoz, who are flying roughly double that number. Current Federal Aviation Administration rules mostly prohibit commercial drone use, and amateurs are subject to strict guidelines: no flying above 400 feet, near populated areas or outside the operator’s line of sight. A federal law passed in February, however, compels the FAA to allow drone use by police and emergency services later this year and allow “safe” commercial UAV use by September 2015. California-based drone manufacturer AeroVironment produces a series of smaller UAVs for the military — some of them backpack size, hand-launchable and as light as 4.2 pounds, able to provide real-time video surveillance day and night. Already in limited use by the U.S. Geological Survey to perform soil erosion studies, the smaller drones cost around $50,000 and could become popular with police departments that need aerial-surveillance capability but can’t afford manned helicopters, which cost in the millions. “Think of a toddler wandering away from home, or an elderly person with Alzheimer’s wandering off in a city,” said Steve Gitlin, a spokesman for AeroVironment. “Think of an office hostage situation where exits and entrances need to be watched, or a hazardous-material incident at a chemical plant where it’s too dangerous to send in people. Commercial drone use has greater potential still. Chris Anderson, a drone hobby enthusiast and the editor-in-chief of Wired magazine, said civilian UAVs likely will be deployed first to perform tasks that are “dull, dirty and dangerous” for humans. Cases in point? Crop-dusting and agricultural monitoring. Inspecting pipelines and offshore oil rigs. Ms. Cummings thinks that within 10 years, shipping companies such as FedEx and UPS will transport packages via autonomous jumbo jets. “Israel has a UAV the size of a 737 that can take off and land and do everything itself,” she said. “It’s packed with cameras right now. Take those out, and you have a cargo airplane. University of Nebraska journalism professor Matt Waite spent nearly two decades as a reporter, often covering natural disasters. Last summer, he was attending a digital-mapping conference in San Diego when he came across the GateWing X100, a small UAV. The drone could fit in the back of a sport utility vehicle. It was hand-launchable. It came equipped with a downward-facing high-resolution camera and a tablet computer controller — just pull up a map and touch the screen to tell the vehicle where to fly. “My jaw dropped,” Mr. Waite said. “I thought of every single fire, flood, hurricane and tornado I had covered. I went to the sales guy and said, here, take my money, how do I take this thing home? Four months later, Mr. Waite founded Nebraska’s Drone Journalism Lab, the first of its kind in the country. In January, his brainstorm was bolstered by an inadvertent proof of concept: An amateur drone pilot in Texas captured aerial footage of a “river of blood” flowing from a Dallas-area meatpacking plant, prompting public outrage and a criminal investigation. Ms. Cummings is on sabbatical in the Washington, D.C., area. Back on MIT’s Cambridge, Mass., campus, however, she makes a habit of closing her office blinds. Mr. Singer said he recently spoke with a federal district judge who believes there soon will be a Supreme Court case involving drones and Fourth Amendment rights. “This is very powerful technology, and can be very useful for the police and emergency workers,” said Jay Stanley, the co-author of the ACLU report and senior policy analyst with the organization’s Speech, Privacy & Technology Project. “But it also has big privacy implications. Communities need to discuss and decide what kind of balance they want to strike here. It should not be decided by procurement policymaking in which the police just buy [drones] and start flying them around. Safety is another concern. Two years ago, the Navy briefly experienced a loss of communication with a 3,000-pound robotic helicopter that was flying toward the nation’s capital; when the drone did not immediately return to its airfield according to programming, military officers reportedly considered shooting it down. And a prototype drone being tested by Houston-area police last fall crashed into a SWAT team armored vehicle during a planned photo-op. No one was harmed and the impact reportedly caused about only $90 of damage — but generated a slew of embarrassing national headlines. Like manned aircraft, drones pose a potential security risk. A 26-year-old Massachusetts man was arrested last September and charged with plotting to attack the Pentagon and the Capitol with a remote-controlled model aircraft rigged with explosives. At a security conference held in Las Vegas last August, researchers demonstrated a lightweight quad-rotor drone that was designed to automatically detect and compromise wireless Internet networks — in short, an autonomous airborne hacking platform — and it cost less than $600 to build. Another presenter demonstrated a drone that flew silently and identified and tracked human targets by locking in on their cellphone signals. “With the man who wanted to fly a drone into the Capitol, his challenge wasn’t getting the robot,” Mr. Singer said. “It was getting the C-4 explosive. That’s the era we’re entering. Mr. Anderson never planned on becoming a drone hobbyist. On a weekend in 2007, however, he brought home a Lego toy robotics kit and a remote-controlled airplane, hoping to interest his children in science and technology. Irritated, Mr. Anderson went for a run. A former physics major at George Washington University, he pondered the sensors in the Lego kit — gyroscopes, accelerometers, Bluetooth — and upon returning home created a crude autopilot. While Mr. Anderson’s children quickly lost interest in favor of video games, Dad was hooked. 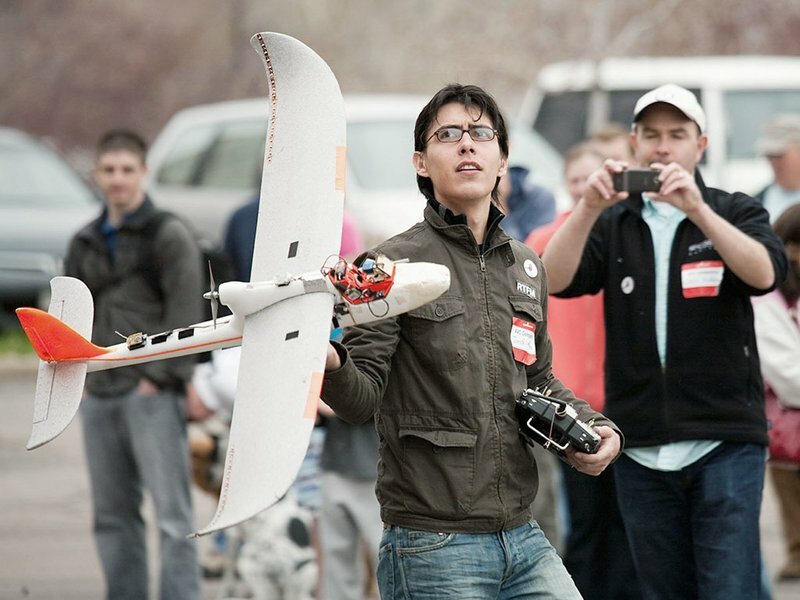 He founded a website for amateur drone enthusiasts, DIYDrones.com, that counts defense and aerospace engineers among its 23,000 members and averages 1.4 million page views a month — numbers Mr. Anderson expects to double by the end of the year. The Internet also is where Mr. Anderson saw a YouTube video of Mr. Munoz’s Wii-controlled drone helicopter. The two quickly struck up an online correspondence that became a friendship; the friendship led them to co-found 3D Robotics in Mr. Munoz’s apartment after Mr. Anderson asked Mr. Munoz to make some avionic circuit boards. According to both men, Mr. Munoz made 40 boards — and sold them all in one day. Three years later, his company is selling components to employees of Boeing and NASA and hobbyists in Germany and China. “In 1977, [Apple founders] Steve Jobs and Steve Wozniak make a computer,” Mr. Anderson said. “Everyone said, ‘What is that for?’ They said, ‘Well, you can program it.’ That’s where we are with drones right now. Users do it because they can, because it’s cutting-edge robotics and awesome. Mr. Anderson has a point: Personal drones can be purchased for as little as a few hundred dollars. Computer chips and batteries become smaller, more capable and less expensive every year. If the regulatory drone future brings to mind the introduction of the automobile — as Mr. Singer suggests — then the cultural outlook may be closer to the spread of computers, with hobbyists leading the way. Mr. Munoz recently heard from a civil engineer in Mexico who is using a drone to help build an airport, saving thousands of dollars on hot air balloon rental costs. Mr. Anderson currently is working with an accomplished windsurfing friend to design and program a drone that doubles as a personal, one-robot film crew. Then there’s Mr. Munoz himself. One windy day, the Internet connection in his offices stopped working. He suspected a problem with a rooftop antenna — problem was, the upstairs access door was locked, and off-site management had the only key. Solution? Mr. Munoz sent a drone to check on things.